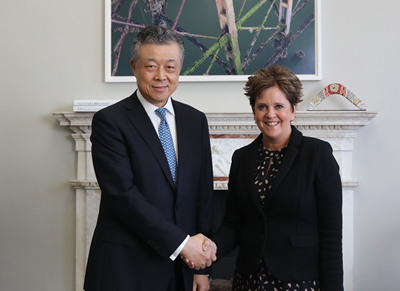 On March 7, Ambassador Liu Xiaoming met with Menna Rawlings, new Director General of Economic and Global Issues at Foreign and Commonwealth Office (FCO), and exchanged views with her on China-UK relations. Kate White, FCO Asia Pacific Director, and Minister Chen Wen of the Chinese Embassy were present. Ambassador Liu congratulated Rawlings on her new position, noting that China attaches great importance to China-UK relations. Early last year, Prime Minister May paid a successful visit to China. The leaders of the two countries reaffirmed their commitment to China-UK “Golden Era”. Fruitful results have been achieved with China-UK bilateral trade in 2018 exceeding 80 billion dollars for the first time and UK exports to China increasing by 6.9%. The people-to-people and cultural exchanges between the two countries continue to develop. Currently, there are 190,000 Chinese students in the UK and 10,000 British students in China. This year marks both the 70th anniversary of the founding of the People’s Republic of China and the 65th anniversary of the establishment of China-UK diplomatic relationship at the level of chargé d'affaire. The development of China-UK relations faces new opportunities, as well as difficulties and obstacles. He hoped that the two sides could work together closely to meet each other half way and continue to enhance mutual trust, overcome the difficulties and remove the obstacles so as to develop a steady and enduring China-UK “Golden Era”. Rawlings said that Ambassador Liu was the first Ambassador to the UK she met after taking office. She agreed with Ambassador Liu on his positive remarks on China-UK relations. The UK attaches great importance to China-UK relations and is committed to promoting the “Golden Era”, she said, expressing the hope that the two sides would maintain close high-level exchanges, deepen cooperation in the fields of finance and the Belt and Road Initiative, strengthen coordination and collaboration in international affairs, such as climate change, and promote greater development of China-UK “Golden Era”.